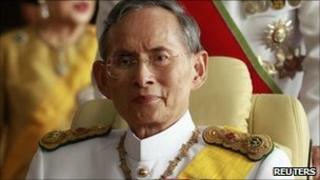 Lese Majeste is a serious offence here, punishable by up to 15 years in prison. The United States embassy in Bangkok says it is providing all proper consular assistance to the man. The man, who Thai police say holds dual Thai and American nationality, was interviewed inside Bangkok's remand prison by a campaigning news website. Mr Gordon says he had no intention of getting involved in politics and merely showed others in the United States how to create a blog. "I want President Obama and Hillary Clinton to intervene on on my behalf," he is quoted as saying. The manager of the website which conducted the interview, Chiranuch Premchaiporn, is herself on trial facing charges of lese majeste after failing to remove quickly enough blog posts deemed to be offensive to the monarchy. There has been a series of such cases recently amid growing criticism about the way in which the law is being applied. A spokeswoman at the American embassy in Bangkok told the BBC the United States had urged the Thai authorities to ensure that freedom of expression is respected and that Mr Gordon receives fair treatment.